In case you were too busy preparing your “Make America Great Again” shirts and caps, you should know that the European Central Bank (ECB) has just published first monetary policy decision this year. 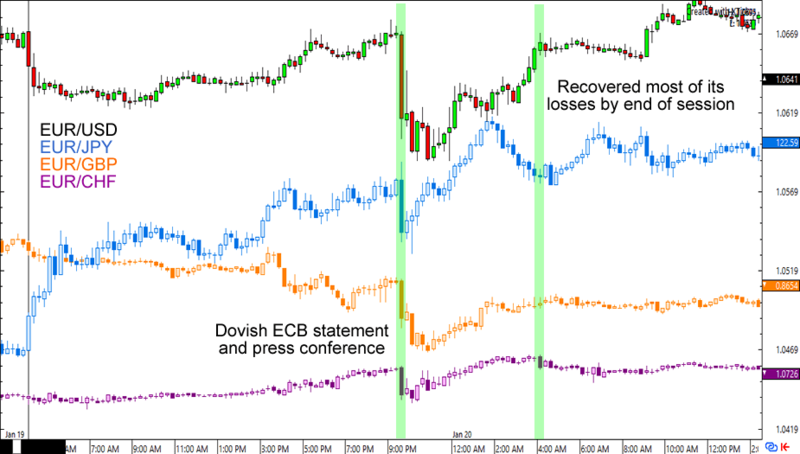 What can we learn from the ECB’s statement and the presser that followed? Here are five major points you need to know. As expected, the ECB made no changes to its interest rates. Rates on the main refinancing operations, marginal lending facility, and the deposit facility are kept unchanged at 0.00%, 0.25%, and -0.40% respectively. Heck, at this point, the even ECB expects interest rates to remain at present or lower levels “for an extended period of time” and well past the horizon of asset purchases! Speaking of the asset purchase programme (APP), purchases will be kept at a pace of €80B until April 2017 before it winds down to €60B until December 2017. The idea has merit. See, while the euro zone’s inflation rate almost doubled to 1.1% in December, it’s still waaaay below the ECB’s target of just under 2.0%. Meanwhile, core inflation – which excludes volatile items – is only at 0.9% for the month. The ECB is expected to watch the Harmonised Consumer Price Index (HICP) for any sustained changes in consumer prices. 1. It must be objective of medium-term price stability. 2. It must converge to the ECB’s goal in a “durable” way. 3. It must be self-sustaining when the stimulus is eventually removed. 4. It is defined for the whole of the euro area, not just individual economies. In short, it must (1) affect medium-term trends, (2) be durable, (3) be self-sustaining, and (4) be widespread. Draghi was quick to emphasize that scaling back DOES NOT mean tapering. If you recall, the ECB surprised market players last month by announcing that it would scale back its monthly asset purchases from €80B to €60B starting in April. Problem is, these kinds of decisions tend to communicate that tapering means tightening. The ECB head honcho dismissed the idea of scaling back could be viewed as tapering although he conceded that the term “tapering” had several meanings. It seems like Draghi and his team are on a wait-and-see mode when it comes to Trump’s potential policies and the possible impact of a Brexit. The euro sold off…sort of. With monetary policy expected to be easy for a long while yet and with the ECB not feeling any pressure from the recent inflation increases, it’s no surprise that the euro fell across the board. EUR/USD dipped to a low of 1.0589 before recovering to 1.0659 while EUR/GBP recovered from a decline to .8610 before trading at .8641. Ditto for EUR/CHF, which was dragged to 1.0708 before shooting back up to 1.0737. For now, it seems like the ECB is shrugging off recent improvements in inflation. In fact, they’ll more likely continue to make it rain for the euro region unless the members see a more sustainable increase in consumer prices. Given what you know of inflationary trends in the euro zone, do you think the ECB will taper its purchases some more in the next few months?